Light is a form of energy. It has wavelike properties and is called a visible form of radiant energy. Light and heat are basically very similar; however, heat has a longer wavelength than light and is invisible. Only those radiant wavelengths between the approximate limits of 0.00038 to 0.00076 millimeters are visible to the human eye. Light sources are broadly divided into natural sources such as the sun, moon, stars, aurora borealis, phosphorescent insects and fishes, and open fires. The other broad division is into sources of artificial light, such as oil and gas lamps, incandescent lamps, arc lamps, various types of gaseous glow lamps, and fluorescent lamps. The original method for comparing amounts of illumination was to use the light from a standard tallow candle held 12 inches from the surface to be illuminated. This unit of illumination is called the foot-candle. Electricians often use a light meter to measure footcandles. in all directions. Let us consider a point source of light placed inside a sphere that has a radius of 12 inches. If the entire inner surface of the sphere is illuminated by an amount of 1 foot-candle, the total light output from the source is 1 lumen. 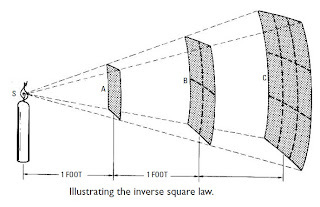 We will find that the intensity of illumination falls off as the square of the distance from the source.With reference to figure below, note that the illumination at A is 1 foot-candle. 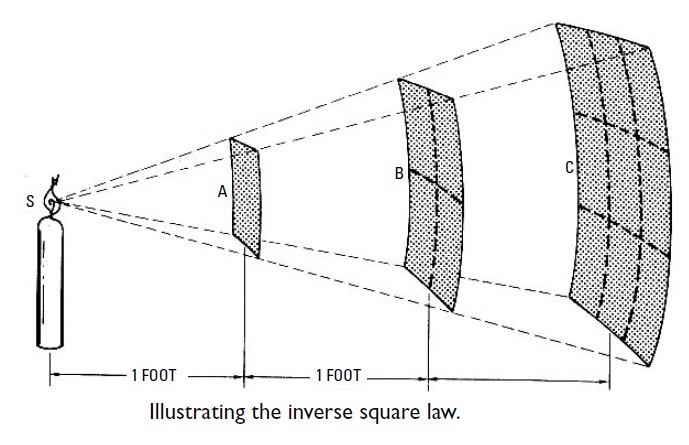 Next, if we remove surface A and illuminate surface B, the same amount of light now illuminates 4 times as much area. C, the same amount of light now illuminates 9 times as much area as at A. Therefore, the illumination at C is 1/9 foot-candle. To get a basic idea of the amount of illumination provided by an incandescent lamp, it is helpful to note that a 60-watt lamp with a tungsten filament and an inside-frosted bulb has a brightness of about 60 foot-candles. brightness of approximately 5 foot-candles. In other words, these are comparative brightnesses of the light sources. Very bright light sources such as the sun or an arc lamp will damage the retina of the eye if viewed directly.